The new wheelchair ramp is completed and gives a great view for everyone into the squid tank. 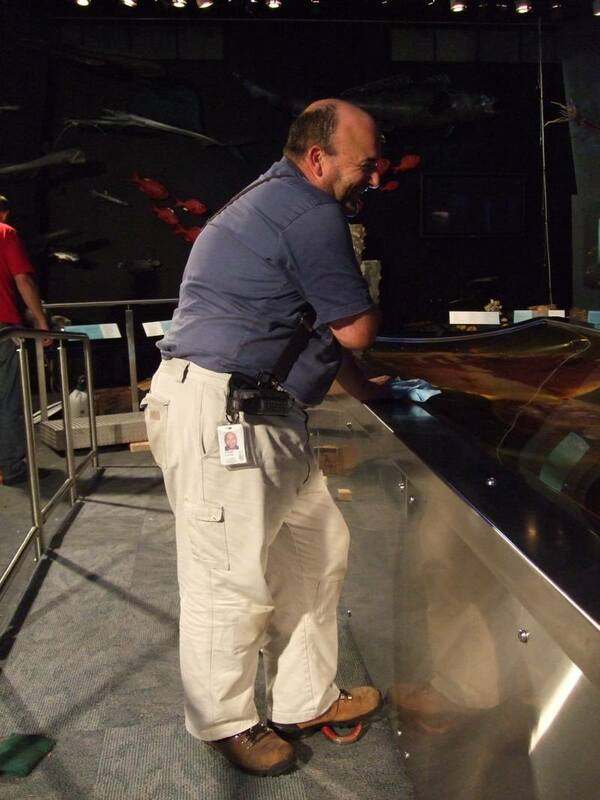 Breaking news from our squid fix-it team – the work is complete and we are on track to reopen the colossal squid exhibition to the public from tomorrow 21 March 2009. 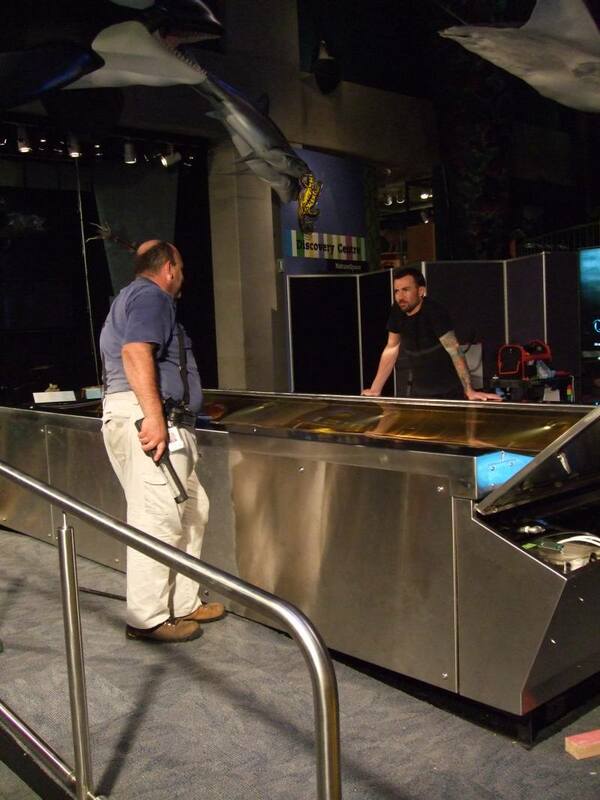 Yesterday Robert Clendon our Conservator and Hutch Wilco, one of our exhibition preparators finished the last few tweaks to the squid itself. They managed to draw the bulk of the squid’s body beneath the surface of the liquid in the tank, but this then caused the mantle to float up! After much discussion, the team decided to stitch through the tissues around the gladius and attach the mantle of the squid to the support raft underneath. By attaching weights to the support they managed to get the mantle under the liquid too. Today the team have been putting the tank back together, which included slowly and carefully rebolting the lid onto the tank. The glycol and water mixture used to fill the tank is still producing gas. The team have refilled the tank just enough to fully cover the squid and make contact with the lid. This has left an air gap at the sides of the tank which will reduce the risk of the tank pressurising and minimise the chance of a spill. It will also reduce the chance of bubbles forming on the lid. Sometime over the next fortnight we will put in the last little bit of liquid. Our hardworking squid fix-it team have also completed the new wheelchair ramp, installed the railing, and put new carpet down. Smile – it’s the end of a long week working on the squid. The gallery space is being tidied as we speak and we are on target for reopening tomorrow morning when you get to see the colossal squid again. Enjoy! I understand your concern regarding the acrylic. Each hole was sanded by hand and flamed, then we checked each one before putting the lid back on the tank. By time we had to put the lid on and bolt it down, the majority of the liquid had come up to ambient temperature. Even so, I was still wary of the danger of the acrylic stressing with the last of the liquid being filled and pressurisation with gas production, so we didn’t do a complete fill, leaving air gaps down either side, and leaving valves open to a spill chamber so that gas and air bubbles exit the tank as they develop. Once we see that gas is no longer being produced, we’ll recycle a percentage of the liquid via gravity feed to remove the bubbles from the lid and do a final fill. We hope to be able to do that this Wednesday 1st. You should come on down and check it all out! Awsome, glad to hear that it went well, the sanding of the acrylic tank concerns me, i work with acrylic quite a bit, building custom resivoirs and the like, and seeing sanding come into play i do hope that they inspected after the sanding, to make sure no small cracks or fractures had started, since as a liquid changes tempeture with most acrylics the acrylic can start to stress and fracture.